2017 Bayleys Laser Nationals - Day 2 - Wrap up Warm for the Taupo Summer! Fresh snow overnight on the mountains at the southern end of Lake Taupo and a moderate SW breeze meant that sailors arriving at the yacht club this morning were greeted by bracing temperatures which resulted in most sailors wearing enough layers of clothing when going on the water to qualify for Michellin man ads. However the clouds mostly cleared, the sun came out and the breeze moderated to provide a challenging but beautiful days sailing with all races completed to schedule. While breeze had a little more South in it than yesterday and was much lighter it was again challenging for all with strength varying from almost nothing to 15 knots and 20 degrees shifts, all every few minutes, combing to significantly shake up the results in several divisions and make consistency hard to achieve. In the Open there is a fantastic contest developing between the NZL and Chinese teams. New Zealand sailors are 1,3, 5 and 7 at the end of day 2 with the Chinese team 2, 4, 6 and 8th. Still leading is defending champion Andrew Mckenzie, but only by a single point from Jianan Wu who had a really strong day and was the model of consistency with two first and a second. Tom Saunders is only 4 points back in 3rd overall with recent youth graduate George Gautrey scoring a bullet in the last race to move up to 5th overall. In the Radial another fantastic contest is developing. After 5 races top youths Alastair Gifford and Josh Armit are tied on points with a good break on third place Susannah Pyatt. Josh won one of todays 3 races while the other were won by master Scott Leith and youth Albert Stanley, both of who's overall ranking should benefit tomorrow once a discard comes in as both are currently carrying an OCS. Both Alastair and Josh have been super consistent so far so it may be a case of who blinks first in deciding the ultimate winner. Another notable feature is that there a 3 women in the top 6 with Stephanie Devaux Lovell in 4th and Youth Worlds rep Olivia Christie in 6th joining Susannah to keep the guys honest. In the Masters race 3 was completely dominated by Nick Brewer from Tamaki. He picked the right hander on the first beat and was never threatened after that. Race 4 was a completely different affair with the lead changing several times and was finally decided only as the fleet neared the finish line when Giles Grigg found some pressure in the left corner and sailed around the leading bunch to record the win. Mark Oliver and Anthony Merrington also featured at the top of the fleet in both races to consolidate top 3 spots overall with Giles. Defending champion Andrew Dellabarca and past champion Kris Decke both suffered from ending up on the wrong side of the first beat in both races to give themselves a challenge for the rest of the series. 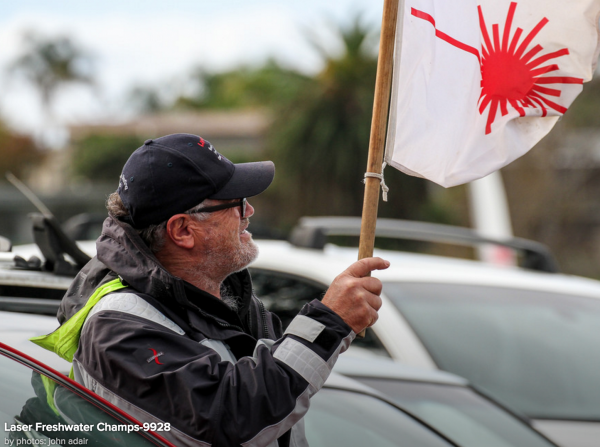 In the Masters Radial overnight leader Phil Wild found the day more challenging, like Andrew and Kris in the Standards getting on the wrong side on the first beat to make life difficult for himself but still managed to lead overall at the end of the day. Race 1 was won by Werner Hennig from Hamilton, who managed to hold onto an early break while in race 2 Richard Blakey just scraped in on the line over GM past World Champ Mike Keeton, who enjoyed the lighter conditions today. Richard had a tough first race today and is another who will be looking forward to a discard coming into play. Leading Grand Master is Hamish Atkinson from Christchurch who has again shown super consistency to sit second overall while defending champion Ed Tam sits 4th after a tough second race. With tomorrows forecast for completely different condition, light Northeasterlies, and half the series still to come there are sure to be opportunities and plenty of further challenges for all. 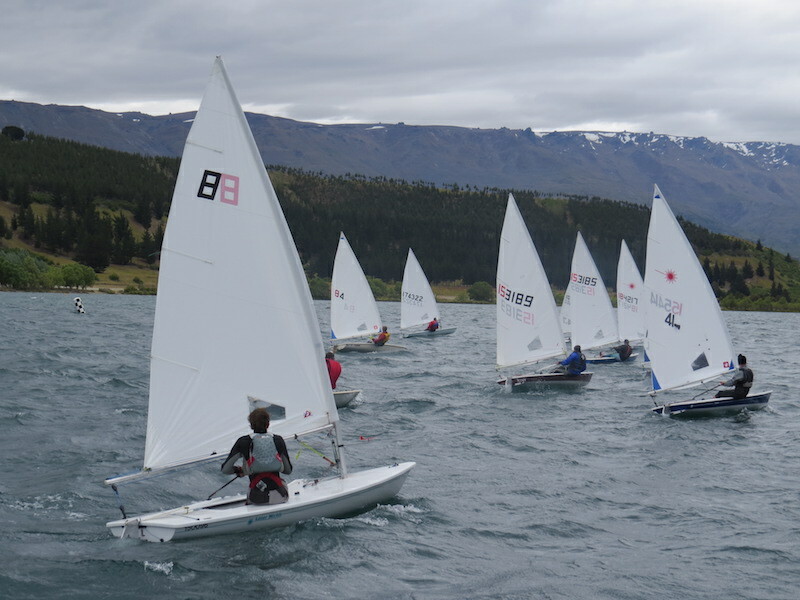 Fresh winds from the westerly quarter provided ideal but challenging conditions for the first day of the 2017 Bayleys Laser Nationals at Lake Taupo Yacht Club. Race 1 got underway after some complications caused by a front passing through with the wind changing from NW to WSW, requiring some adjustments to the course. The wind was blowing out of nearby Acacia Bay at 10 to 20 knots with plenty of big shifts and oscillations throwing up constant challenges to all the sailors and a few thrills and spills as the gusts came down the course. The fleet of 120 started in 4 divisions with the Standard Open, Radial Open, Masters Standard and Masters Radial all having between 30 and 40 on the start line. In the Open defending champion Andrew McKenzie and NZL squad sailor Tom Saunders face a tough challenge from the visiting Chinese team sailors. At the end of day 1 Andrew has well and truly laid down the gauntlet to defend his title with 2 bullets. The Chinese team had a great day with Ning Zhao in second, Jianan Wu in 4th and Yuchen Gu in 5th. 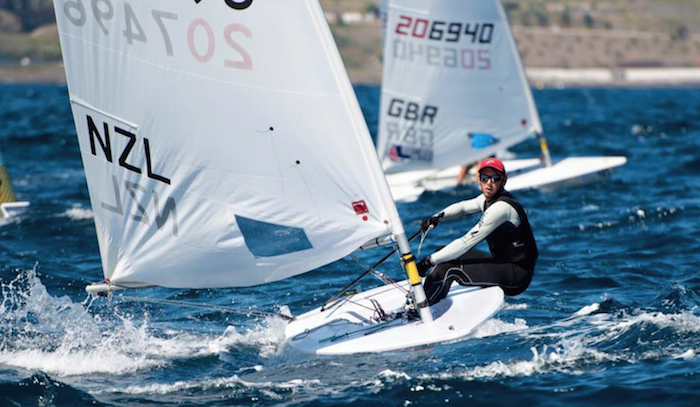 Breaking them up is NZL squad member Tom Saunders in 3rd, scoring a 2nd and 4th with our recent Youth Worlds rep George Gautrey also close to the action, finishing the day 6th overall. 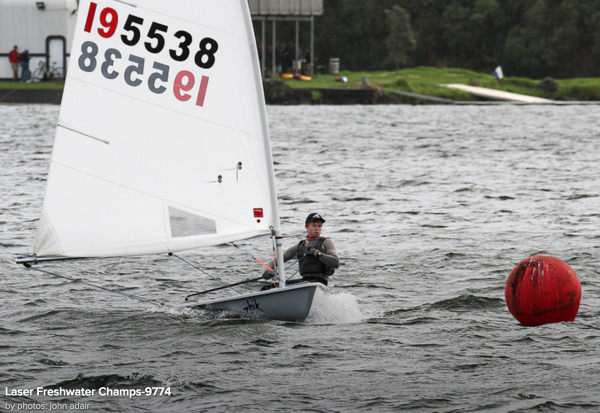 In the Radials top youth sailor Alistair Gifford has a stellar day to lead with a first and second from our other leading youth sailor Josh Armit, who won the first race and then backed up with a third in the second race. They are followed by top Master Scott Leith, who has elected to sail in the Open Radial fleet, and top Women's sailors Susannah Pyatt sits in 4th. Local Youth sailors Blake Woodfield wraps up the top 5 with a consistent 5th and 6th for the day. In the Master Standard defending champion Andrew Dellabarca (M) had a tough first race after getting on the wrong side of a shift on the first beat but recovered to take out race 2 after a close battle with past champion Kris Decke (AM). Kris leads the day overall after notching up second in both races. Returning to the Nationals for the first time in several years Apprentice Giles Grigg had a fantastic first race to lead all the way and then did not get it quite right in the second race to finish the day equal 4th with Andrew. Second and third overall are leading GM's Peter Kempkers and Mark Oliver, who were both super consistent exchanging 3rd and 4th in the 2 races. In the Masters Radial Apprentice Phil Wild won both races convincingly with Richard Blakey (M), defending champion Ed Tam (M) both consistent to hold second and third overall. GM's Kevin Welsh and Hamish Atkinson and Master Mike Knowsley are the next group all tied on 11 points after 2 races. So with a forecast for a bit less but still a solid breeze from the WSW tomorrow, we look forward to more quality racing and the opportunity for the leader to consolidate their positions. The Laser North Island Champs was again held this year as part of the summer regatta at Napier Sailing Club on the weekend 26/27 November. Saturday dawned with a moderate Northerly breeze to greet the fleet of 40 Standards & Radials as well as good fleets of OK's, Paper Tigers, Flying 15's etc which gave the regatta a great atmosphere. On the way out to the course the breeze shifted to the NW and started to freshen. The first race was held in about 15 knots, a typical shifty and gusty offshore breeze, which continued to freshen throughout the day, peaking at close to 30 knots by the finish of the 4th race. This resulted in many swims through the fleets and more than a few retirements in the latter races. Sunday carried on where Saturday left off, with the wind over 30 knots by 11am causing an early cancellation of the days racing. In the 12 boat Standard fleet reigning National Masters champion and defending NI champion Andrew Dellabarca from Wellington was most consistent, winning 3 races to take out the trophy convincingly from Howick's Mark Oliver and Pupuke's Dean Drummond who were tied on points in 2nd and 3rd. Rob Woodward and I had a close battle for 4th with Robs young legs ultimately victorious to clinch 4th spot by a single point. In the Radial's, with a good fleet of 27, defending NI champion and leading youth Josh Armit was able to successfully defend his title after an extremely close struggle with master Scott Leith and fellow youth George Gautrey, who's unfortunate OCS in the last race saw him finish down the order as there was no discard and ultimately cost him victory in that race and the series. Close behind Scott were another group of youths with Alastair Gifford, Blake Woodfield, leading women's youth Olivia Christie and Joshua Bull all sailing consistently to wrap up the top 6 slots. Second Master was Ed Tam in 7th, just holding out leading women's master Michelle Bain. Napier again provided a great venue for us, with good racing and a great social in the evening. It was unfortunate that the gales that prevailed throughout the country over the weekend got the better of conditions on the Sunday but with 4 quality races on Saturday and close racing in both fleets everyone could go home feeling well challenged for the weekend and looking forward to next weeks Sir Peter Blake regatta at Torbay. 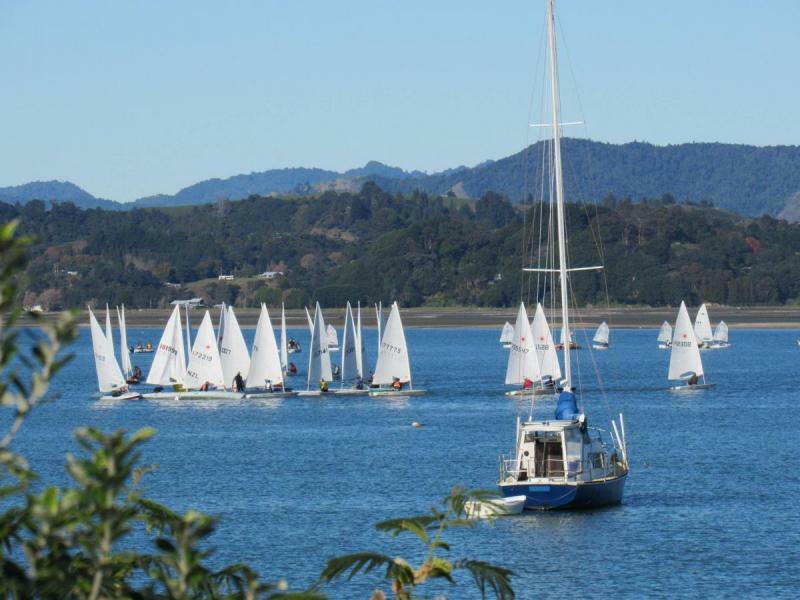 10 Laser Radial sailors gathered at Ravensbourne Boating Club in Dunedin on the 19th and 20th November. There were 8 Masters, 1 Youth and 1 Open fleet. Interestingly there were no Full Rigs or 4.7s. The racing was combined with the Bic Otago Champs. On the Saturday, racing started at 11 o’clock with a 10- 14 knot NE. The wind steadily built over the day to reach 20-23 knots in race 4. Peter Graham from Ravensbourne dominated the regatta with 3 race wins, followed by Hamish Atkinson from Naval Point club with 3 second placings. In race 4 , Hamish managed to come through in the final downwind leg to take a race win from Peter. 3rd overall was Neil Morris from Mc Andrew’s Bay Boating club with 5,3,4,3. 4th was Jenny Armstrong sailing a 3,4,5,4 series. This was Jenny’s second time in a Laser and she will be one to watch in the future. Jeremy from Vauxhall Yacht Club was 5th, Dragos from Otago Yacht Club 6th, Morris VYC 7th, Gwynn MBBC 8th, Graham VYC 9th and Oliver RBC 10th. Unfortunately Sundays racing was blown out with a fierce SW gusting up to 40 knots. Special thanks to Peter Graham Traffic Management and Control for sponsoring the regatta and to Ravensbourne Boating Club for hosting a great championship. 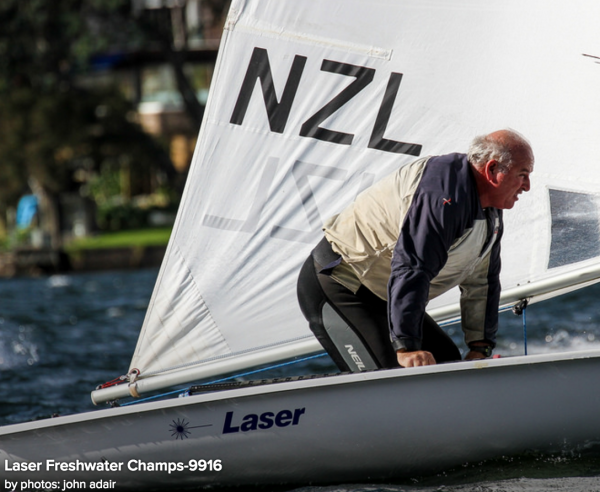 Four kiwis were included in the 50 strong fleet for the South Pacific Laser Masters at RQYS. We encountered a variety of conditions, from very light to a distinctly testing 20+ knots, but could not fail to enjoy the sun and balmy 27 degree days as a mid winter break from the wet and windy weather back home. Day 1 dawned with a 4 to 6 knot breeze, just sufficient for racing to commence on time and freshening a bit for race 2. Day 2 blew out any cobwebs with a strong offshore breeze and typical Moreton Bay short steep chop for both races. The wind averaged about 20 knots but with gusts over 30 recorded at nearby Brisbane airport, the day proved a challenge for many in the fleet and the source of great discussions sitting in the sun at the bar afterwards! Day 3 was a drift out and tow back with no racing possible after the light offshore breeze refused to freshen to race strength. The final day started with a couple of false starts in a westerly breeze but this was then replaced with an unsteady NE sea breeze which allowed two good races to wrap up a successful series. In the Radials Mike Knowsley (M) sailed an excellent and consistent series to finish a creditable 3rd overall, even after being "robbed" (shades of the underarm incident??) of a 2nd over the line in race 1 by an eagle eyed race officer at the start. Our other Radial rep, Roger Winton (GM) from Whangarei suffered a bout of flu which contributed to his having an up and down series to finish mid fleet in 11th overall. In the Standards the overall results were significantly affected by a couple of unusual factors. In race 3 the majority of the fleet rounded the wrong top mark, demonstrating that ex world champions are not always right and should not always be followed, which really mixed up the results for that race with many sailors withdrawing. The results were also skewed by current GM world champion, expat Kiwi Gavin Dagley, missing the first 2 races after misjudging the start badly by missing his plane to the contest! Anyway the net result was that few in the Standards were able to post consistent results and I ended up 4th overall in spite of an at times inconsistent effort and Chris Sadler (GM) finished 6th overall after a strong series which suffered from a couple of very unlucky breaks when right in the hunt in several races. Overall a very enjoyable series and to cap it off there was good interest from many of the Aussies there in coming to the WMG next April. The forecast glorious weather but light winds eventuated, but if anything it made a holiday weekend in the EBOP more appealing. 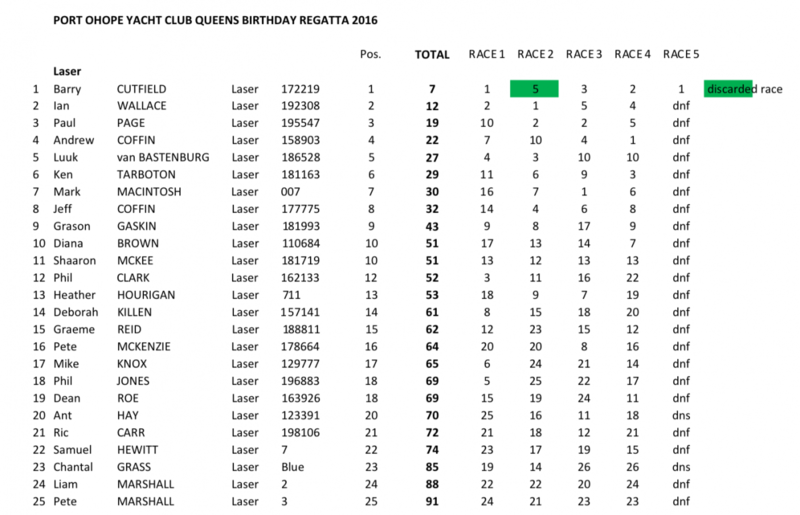 A good fleet of 25 Lasers, as well as 6 Jolly boats, 5 Zephyrs and 10 Opti's were on the water. Great to see 5 women Laser entries, all sailing full rig! On Saturday the race committee did great to get 4 races in, and even if relatively short triangle or triangle + Windward-Leeward. Sailing in Ohiwa harbour gives plenty of tactical options playing with the tides and sandbanks. Regular visitors from Panmure, Ian Wallace, Paul Page and Andrew Coffin again gave top locals Barry Cutfield, Ken Tarboton and Mark mackintosh a run for their money. The club put on a wonderful buffet that evening, with some 60 people cosily filling the club house. Sunday saw very light winds again in the morning, but threatened to die out. The first race got started for a scheduled triangle with some 2-5 knots of breeze from the east, against an outgoing tide of 1 to 3 knots from the west. Interesting sitting with transom to the start line running at 'full' speed just to hold position. After a very quick beat to the top mark the fleet went for a reach into a channel current to the wing mark, hugging the banks as much as anyone dared. Leading around the wing mark was Luuk Batenburg, trying to keep cool with Paul Page on his transom. Not far behind the rest of the fleet bunched up for some fun at the mark. The second reach had to cross two other channels with a dying breeze. Local knowledge saw Barry Cutfield sneak along the tidal lee of the middle bank to cut across the current well below the bottom mark, rounding it and finishing to win the regatta just before the breeze gave up, so no-one else could get around, let alone finish within the time limit. Funniest race result ever with one 1st and 24 DNF's!